I get a little bit hard to please when it comes to recipes that really intrigue me, but this one did. It also ticked my boxes of family friendly (check), one pan (check), re-heatable (check), healthy (check) and bacon (check). Oh and it has a perfectly poached egg on top (double check). I first made this one lazy Sunday for brunch but since then I have wheeled it out for lunch and dinner too. Basically, any occasion when you want a bowl of comfort. Savory porridge does sound a bit wrong, but change the name to risotto and no one bats an eye. The method of this is very risotto-esque but instead of rice, it uses pinhead or steel-cut (not rolled) oats or buckwheat groats. Buckwheat has been making a bit of a regular appearance on here of late. You may have noticed that I am a bit like that, I discover a new ingredient and go a bit swoony over it before I move on to the next thing. Anyhoo, if you’ve bought buckwheat groats to make my soda bread or spiced autumn porridge recipe and you have some left over, have a bash at making this. The nice thing about this recipe is that it takes one new ingredient (buckwheat) and introduces it to more dubious types of eaters through the mask of reassuringly familiar ingredients – tomato, bacon, egg. It originally came from the Fabulous Baker Brothers book and, of course, I’ve twiddled with it a bit. They serve theirs on buttered toast but I feel like that is a carb layer too far. You can make a batch of this for a crowd, make wells in the top once it is cooked. Crack eggs into the wells and bake the whole thing until the egg whites are set (around 8 minutes at 200c/400f). An English shakshuka if you will. Leftovers can be formed into burgers and pan-fried until crispy on the outside. 1. Heat a large saucepan or Le Creuset over a medium heat, then chop the bacon into roughly 1 inch pieces, straight into the pan. I use scissors to do this. 3. Add the buckwheat or oats and toss them through the bacon before adding the tomatoes. Mix well and bring to a simmer. Simmer for 10 minutes, stirring occasionally then mix well, cover with a lid and turn off the heat. Leave off the heat for 15-20 minutes with the lid on. The grains will swell and cook in the heat of the mixture; it should be like a thick risotto. 4. While it sits, chop your basil and prep your eggs. 5. Fill a frying pan with boiling water up to around half an inch from the top. Keep your frying pan on a high heat until bubbles start to appear at the bottom of the pan. 6. Break each egg into a cup or ramekin then gently tip them into the pan. Leave the eggs for 2 minutes with the heat on medium. The temperature of the egg will bring down the temperature of the water. You don’t want any bubbles to be appearing once the egg goes in as they will break up the egg white. 7. Then, turn the heat off and baste the tops of the eggs with water (if they are not totally covered by water). Leave the eggs in the pan for 1 minute after turning the heat off then test one egg by lifting it out with a slotted spoon and touching the yolk. You should be able to feel if the yolk needs a little longer to cook. 8. When you are happy that the yolks are cooked to your liking, remove them with a slotted spoon then lay them on a damp tea towel to drain for a few seconds. If you want to cook them ahead of time you can put them straight into a bowl of iced water at this stage and then simply heat them in a pan of hot water for 30 seconds before serving. You can even do this with eggs cooked the day before. 9. Finish the porridge by having a quick taste and adding vinegar, salt and pepper to balance the flavour. Then top it with a soft-yolked egg and dig in. You can now buy the equipment I use in this recipe through my shop. I’ve spent years testing my favourite bits of equipment so rest-assured that whatever I recommend is the best tool for the job and will give you great results without cluttering your kitchen with unused tools. 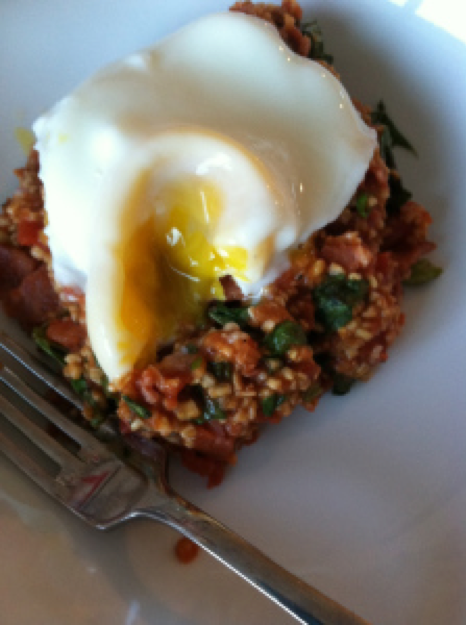 Find more recipes for bacon, eggs, breakfast/brunch and canned tomatoes here.